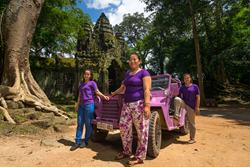 Lavender Jeep Siem Reap is taking on both countryside roads and gender equality in Siem Reap, Cambodia, the home of Angkor Wat temple. Lavender Jeep Siem Reap takes guests on tours of Siem Reap in an American A2 Military Jeep that once served during the War in Vietnam. It has since been repurposed for civilian life and, while over 40 years old, the 4x4 Jeep thrives in the Cambodian countryside where dirt roads are muddy, undeveloped and ready for a challenge from an off-road vehicle. But the company goes beyond providing a fun experience for tourists. The tours are designed to empower by creating jobs that pay a living wage for women entrepreneurs. In a country where women are expected to follow the Chbab Srey (a code of conduct that dictates who one should be and how one should act), Lavender Jeep Siem Reap is challenging the status quo, pushing gender norms, and redefining what it means to be a woman in Cambodia. Lavender Jeep Siem Reap is unique in Cambodia as it is structured as a cooperative. 30% of profits are transferred to its drivers and the remaining 70% to Bridge of Life School, an NGO providing free educational related programming in the countryside, building a bridge to new opportunities for the next generation of women and children. Curated experiences have been designed for tourists looking to see the real Cambodia and make a difference doing so. This includes visits to Angkor Wat & Angkor Thom, UNESCO Heritage sites, as well as trips deep into the countryside to see rural temples, Buddhist pagodas, floating villages, and everyday life in the provinces. As the drivers come from the villages visited tourists receive a truly unique, first-hand perspective. Guests, media agencies, and tour companies may visit our website at http://www.lavenderjeepsiemreap.com or email info(at)lavenderjeepsiemreap(dot)com for more information.